A Bute-built luxury cruise ship was officially named in a ceremony at Holy Loch Marina on Tuesday, April 5. The vessel - the latest addition to The Majestic Line fleet of cruise ships operating out of Dunoon - was constructed by the Ardmaleish Boatbuilding Company, and fitted out by Bute Homes. 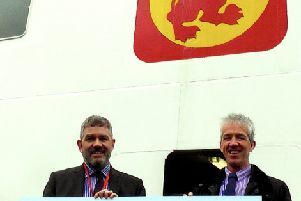 Ewan Ferguson (centre) of Ardmaleish Boatbuilding Company with Andy Thoms (right) and Ken Grant (left) of The Majestic Line at MV Glen Etive's naming ceremony on April 5. Paying tribute to the Bute businesses who played a massive role in reaching Tuesday’s milestone, Andy Thoms of The Majestic Line, said: “I have to thank Ewan Ferguson and his wonderful team at the Ardmaleish Boatbuilding Company on the island of Bute for creating this lovely little ship for us. It was built on time and within budget and I can honestly say that during her construction, Ewan Ferguson and myself - perhaps not normally known for our normal calmness - never had a cross word! “They’re a wonderful company with a loyal, skillful and pleasant workforce who have taken a great pride in building this ship for us. The naming ceremony was carried out by actress of stage and screen, Barbara Rafferty. One of Scotland’s best loved and respected actors, Barbara is probably best known for her role as Ella Cotter in the iconic TV series ‘Rab C Nesbitt’. However her impressive career includes countless theatre productions and films such as ‘The Last King of Scotland’ as well as the role of Granny Mainland in CBBC’s ‘Katie Morag’. Barbara grew up in in the tenements at Dalmuir West on Clydebank, which were built to house the shipyard workers. Her father, David Brown, worked in the engine rooms at John Browns Shipyard as a jigger and tool setter. Following her official naming, guests and visitors were invited to climb aboard for a closer look. There are intentions for the Glen Etive to call at Rothesay on Saturday, April 16, where visitors will also be invited aboard. Details of the ship’s visit will be published once confirmed.